Psychology 10 Edition PSYCHOLOGY: FOUNDATIONS AND FRONTIERS introduces readers to the fascinating world of psychology by presenting important findings from established and current research, emphasizing the many ways psychological theory and research results are being applied to benefit human welfare, and providing helpful visuals and learning tools. An integrated pedagogical study system helps readers master the material step by step. Try This activities illustrate psychological principles or phenomena by providing numerous opportunities for readers to learn by doing. 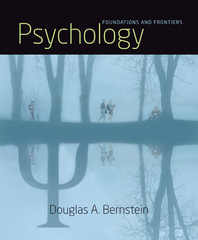 Other features include Linkages diagrams and sections that show readers how topics in psychology are interrelated, Thinking Critically sections that apply a five-question approach to various topics, and Focus on Research sections to help readers think objectively about research questions and results.